Wing span: 1 3/4 - 2 3/8 inches (4.5 - 6.1 cm). Identification: Robust. Forewing is long and pointed, hindwing is lobed. 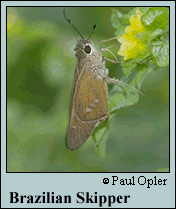 Upperside is brown-black with large translucent spots on both forewing and hindwing. Underside is red-brown; hindwing has 3 or 4 cream spots. Life history: Adults have a very fast flight and are strong migrants. Females lay eggs on the upperside of leaves high up on the host plant. Caterpillars usually spend the day in shelters of rolled leaves and emerge after dark to eat leaves. Flight: Late summer in the north; several broods from April-December in South Texas; two broods from July-November in Arizona; throughout the year in Florida and the tropics. Caterpillar hosts: Various cultivated plants in the canna family (Marantaceae). Adult food: Lantana in Arizona. In Costa Rica, nectar from large white or pale yellow flowers of woody lianas, trees, and shrubs. Habitat: Gardens and residential areas. Range: South Florida and South Texas south through the West Indies, Mexico, and Central America to Argentina. Periodically strays and colonizes north to southern Nevada, north Texas, Illinois, and Massachusetts.